If one or more of your teeth are extensively damaged or infected and cannot be saved, you may require a dental implant procedure. At V Care Dental, we can provide professional tooth extraction and replacement services for patients of all ages across Melbourne. Our highly trained and experienced team can deliver tailored treatment plans and affordable dental implants that meet your specific requirements. You can trust us to get the job done and leave you feeling satisfied with the outcome. 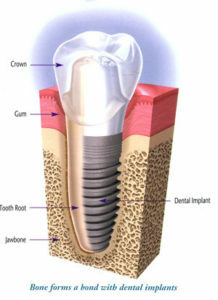 A tooth implant procedure is an innovative treatment that can be used to replace a missing tooth. The procedure involves placing an artificial titanium rod into the jaw bone. This implant is a non-intrusive solution that replaces the root portion of the natural tooth. It also allows new bone cells to grow, which seamlessly merge with the implant and help to lock it into place. Our dental implants in Patterson Lakes and Frankston are an effective method of tooth replacement for patients. They can be used to replace one tooth or several teeth where necessary. Depending on the extent of the damage to your natural teeth, several implants and crowns might be necessary. In any case, the specialists at V Care Dental can achieve the best possible results. Our dental implant procedure requires a series of tests and minor operations over the course of several months. Your dentist will perform x-rays to identify where the implant should be placed, followed by an operation to place the implant in your jawbone. Patients are usually given an anaesthetic to ease discomfort, but some pain is expected afterwards from the incisions. The bone will need time to grow around the implant. After a few months, the implant should be stable enough to serve as a foundation for an artificial tooth. This is then screwed or cemented into place. The tooth implant procedure can be slow, but the results are more than worth it in the end. If you’re looking for affordable dental implants in Melbourne, look no further than the highly trained team at V Care Dental. Contact us today to learn more about our tooth removal and replacement services or book an appointment for a time that best suits you.